Several months ago, I purchased a new dust collector. Before, I had a Jet 1.5 HP dust collector with a cartridge filter and vortex cone. It did an OK job and was piped into my shop with 4” PVC. My measurements of the flow at the dust collector were 670 CFM at the 6” port and only 450 CFM at the 4” port. The maximum static pressure was 10.25” Inside my shop, the flow was greatly reduced. The dust collector is piped into my shop with a couple of 8” metal 90 degree elbows and then reduced to 6” DWV pipe. The unit arrived on one full pallet. The pallet arrived with no damage and the driver moved it into my garage. One issue that I had is that there were a lot of individual boxes and none of them were marked. That meant that I had to open them all to find the parts and make certain nothing was missing. Only one part, a blast gate, was missing. The choices for mounting the dust collector was either a wall mount or legs. I chose to use the legs as I did not want to have any vibration transmitted to the house. I used pressure treated 2×4 to mount the legs on. They had holes in them to prevent the dust collector from moving due to vibration. This also allowed me to level the legs as the garage floor had a slope to it. The parts of the dust collector were very heavy and I used an engine lift to put it together. I did most of it by myself but my wife helped a couple of times. The assembly went pretty smoothly and took me about 2 days. The cone is thick steel and quite heavy and I used an engine lift to help get parts in place. The most difficult part was putting the motor and impeller assembly on top. The 5 HP motor was very heavy and awkward. I ended up attaching it by laying the collector on its side and using the engine lift to maneuver it into place. I used the engine lift and a block and tackle to get it back upright. It was not easy. • This is a USA made unit with a USA made Baldor motor. • It is a heavy well built, solid unit. The cone and cyclone barrel are heavy gauge steel with good welds. The fan housing is very heavy duty plastic. None of the parts seemed cheap or under built. • The dust collector runs smoothly and quietly. I can stand beside it and have a conversation. • The paint job is great without any runs, scratches or other defects. 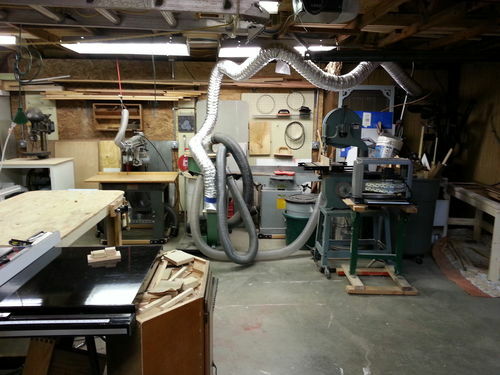 • The remote control works well through the wall from my shop into the garage. • There is very little dust showing up in the filter which means that the cyclone works well. • Oneida advertises that if you purchase one of their dust collectors, they will provide design for the ducting. They did provide this service but it was USELESS. I provided them with a lot of information and the limitations that I had. The design that they produced did not take into consideration anything that I had provided and only what they thought was best. It would not work for my shop. Of course, they are trying to sell ductwork. • This dust collector has a lot of power. However, the maximum CFM that I measured was around 1650 while the specification for the unit was 1860 CFM. I have written to Oneida about this but have not gotten a response. • I think that the filter is a bit undersized at 110 square feet. Many other brands use significantly larger filters. If I ever have to replace it, I will go with larger ones. However, the dust filter pressure is within the typical range and I have not had any problems with filter clogging. • The remote control has no dip switches to change the code. I found out that it was on the same frequency as the fan in my wife’s sewing room. She complained several times that something turned her fan off and I was surprised a couple of times that my dust collector suddenly shut off. I had to get up to the cheap fan on her ceiling and change the dip switches on it. • The directions could be a lot better. They are barely adequate and for some will be difficult to follow. • In several cases, the bolts supplied by Oneida were not long enough because of the thickness of the foam seal that one had to install. I had to go out and buy longer bolts. Of course once the ½” thick foam seal was compressed the original bolts were long enough. • A couple of times, I did call back with questions and found that the people I talked to did not know very much. At that time, the person had never even put one together or had any hands on experience. 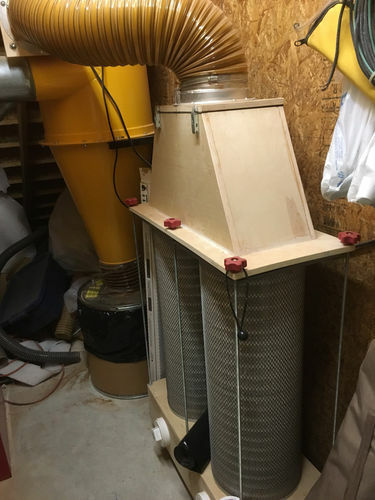 Overall, I am pleased with this dust collector as it is a very solid, good performing unit. Oneida should take note as there are a couple of things that Oneida could change to make it even better. I am writing a blog to better describe the unit, the build process and performance testing. I bought the same Oneida Super dust Gorilla in 2008. It has been a workhorse and completely trouble free. I set mine up underneath an enclosed stairwell in my shop that is insulated and soundproofed with spray foam insualtion and is therefore whisper quiet. I also have a 5 hp compressor under the stairwell. I have 6 remotes for my dust collector and in ther last 8 years I had to replace only one. I designed my own ductwork instead of using Oneida’s design service and I bought the metal spiral ductwork from a big woodwork supply store that is about 30 miles from my home..so I did not have to pay shipping for it. Since making several design changes in my shop tool arrangement i now have some 4” pvc combined with my metal duct pipe. I can agree with you on Oneida not knowing as much when asking questions. I chose the Clearvue over the Oneida because I got a much better feel for how the unit would work from talking to the lady at Clearvue. 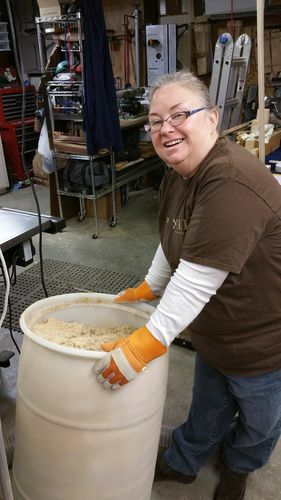 She knew the ins and outs of the unit and how it works in their own shop. Also, it was a one stop place for me to purchase everything I would need. That includes the 6” blast gates, hoses and 4” transitions. I don’t understand why you say you have to get all the parts from other suppliers though. You can order a Clearvue unit either with or without the filters. It’s right on the main pricing list. The only thing they don’t supply is the dust bin but that’s because everyone has different height requirements for their installations. If you are wanting some filters, let me know. I bought the filters that came with the Clearvue but I ended up piping it outside so I am not using mine. I am pretty sure they were made by Wynn Environmental. Going off the top of my head, it’s 2 filters that stack around 6’ high and maybe 16” across. I’m impressed that you actual measurements were even this close as measured cfm can vary a lot and can only be accurately predicted with a fan curve and an accurate measure of the flow losses and restriction in your ductwork. That’s why they quote 1850cfm at 2.5” SP. My understanding is that the standard DC test setup has a manometer in a 10’ run of straight smooth walled pipe of the same diameter as the inlet sucking an open room. Also, in order to be universal, all test results would then have to be corrected to STP (standard temp and pressure) as any variation in air density will have an affect on the flow rate. Sounds like a reliable beast approaching the upper limit of an in-home hobby shop. 5,000 cfm is the threshold for what you can have inside the shop, and beyond that, if you recirculate the air back into the shop, you get into fire suppression requirements that cost more than the DC system itself. Rredoak…I purchased the extra remotes from Oneida. I don’t know if they are available elsewhere at a lower cost but I do know these all work and are programmed right out the package to work with my system. I read someone’s post that they cut a small opening in their dust bin and covered it with a piece of clear plexiglass. I considered doing this but wonder if it would quickly get to the point of having the view blocked from the dust inside. I will be posting a blog segment in the next couple of days concerning my testing. I used a straight run of 8 inch pipe and a digital thermal anemometer from Dwyer. I really like the dual filter set up and at some point will do something similar. Great looking and sounding setup. I am in the process of upgrading from an HF “Frankenvac” (standard mobile base, Thein filter lid on chip barrel, exhaust out 6” flex hose) as my machines connect one at a time with Rockler quick-connects to the two 4” hoses. I purchased a Super Dust Deputy, 4” PVC pipe/fittings, ordered the Rikon impeller so often mentioned (it’s on the way!) and have a plan for the stack to a “top hat” configuration. Last bit I’m working on is how to raise the lid so I can remove the chip barrel for emptying. For years I have a clear view 5HP. I put together alone, that was a job! That is great b2rtch…...have you done any measurements on flow or static pressure. It would be I interesting to compare actual data. I suspect they are very similar. I just know that my installation is not as good as it could be because I have to use a sharp 90 degree elbow right into the cyclone.I know enough about fluid dynamic to know that I loose a lot of suction right there but all together my installation works very well for me. I made all the ducting using inexpensive 6.00” of the self duct from Lowes. To prevent the duct from collapsing I made a vacuum safety valve. I had to use two 90 degree bends from mine to get in the shop. I used 8” long radius elbows from Oneida. After that reduced to 6” DWV into the shop. The important part is that even with reduced flow due to the elbows and size reduction I still get enough flow.